Keratoconus is an eye disease that can cause distorted, blurry vision that often requires more complex contact lens solutions. The condition involves progressive thinning of the cornea (the front surface of the eye), causing the surface to protrude forward in a cone shape, giving the disease its name ("keras" meaning cornea, and "konos" meaning cone). With increased severity, the amount of protrusion and irregularity of the cornea increases, too.1 Keratoconus management is often reliant on early detection.2 At our Adelaide and Woodville branches, our optometrists have an interest in keratoconus, and one of our optometrists, Lachlan Hoy, has written the chapter on keratoconus in the globally distributed Contact Lenses textbook to be published in 2019. If you are interested in making an appointment, please contact us for more information. Microscopy of the front surface of the eye conveys the shape and thickness of the corneal surface. 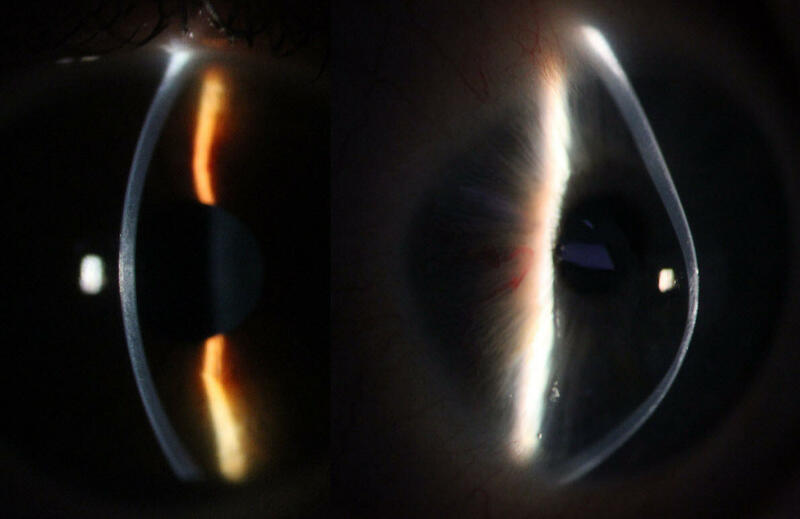 The above images show a normal, regular cornea on the left and a keratoconic cornea on the right. Note the forward protrusion of the cornea in the keratoconic eye, with a notable thinning of the cornea compared to the normal eye. Corneal topography is a non-invasive way to measure the contours and shape of the cornea. It is the ‘gold standard’ in diagnosing and assessing keratoconus.11 Topographers work by shining concentric rings of light on the cornea and assessing what is reflected back. If the cornea is even and regular, the rings are reflected back evenly as well. The above images are the topographical results of a relatively normal cornea. Note the regular rings on the left image and the fairly concentric and uniformly coloured contour maps on the right image. Areas of yellow represent areas that are more curved on the eye. These images portray a regular cornea with no distortions or irregularities. In contrast, these images are results from a topography taken of a significantly keratoconic eye. Note the distorted and compressed rings on the image on the left. The coloured contour maps of the same eye show a much darker red area over the centre of the eye, conveying the protrusion or ‘cone’ of the cornea. This is significant to vision quality as the distorted surface is within the pupil zone (the black circle). The OCT is an invaluable tool that allows practitioners to assess different layers of the eye as high-definition cross-sectional scans. This device was initially used to diagnose and manage macular degeneration and glaucoma at the back of the eye. More recent advancements in technology have enabled us to utilise the precision of these scans for assessment of the front portion of the eye: the cornea. 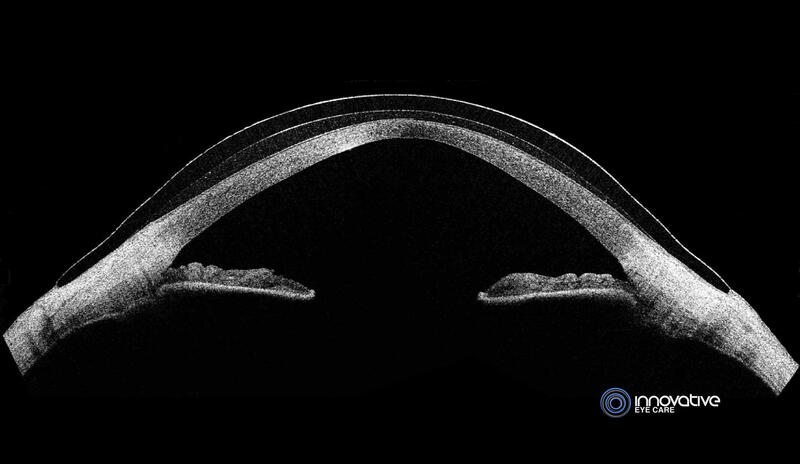 Due to the highly detailed images taken with an OCT, the different layers of the cornea are visible, as well as their configuration as the cornea protrudes forward (as shown above). As keratoconic eyes exhibit an overall thinning of the cornea at and around the cone, these layers are able to be measured and quantified to better monitor disease progression. The OCT also helps us assess the relationship between contact lenses and the eye, to achieve the most ideal, comfortable and safe fitting contact lens.12 The above example of a custom scleral lens on the eye conveys adequate clearance over the cone and a nice smooth landing of the edge of the lens on the white part of the eye to ensure maximum comfort. In rare situations someone with severe keratoconus can develop corneal hydrops, a condition where the posterior membrane of the cornea ruptures causing extreme corneal swelling, pain and ultimately scarring. Patients who have corneal hydrops often require a corneal graft due to the residual scarring. If the cornea becomes too thin or scars excessively over time, not even a perfect fitting contact lens may provide clear enough vision. In these instances a corneal graft may be required. The longer this can be delayed with contact lens wear and careful management the better – grafts have a risk of rejection, require long courses of steroid drops, and often require spectacles or contact lenses to be used after the surgery to see to the best level. It is important for keratoconic patients to be assessed and fitted by an experienced optometrist with a strong background of keratoconus management. Our optometrists Lachlan Hoy, Karl Evans and Joanna Rohrlach have an interest in contact lens fitting and have treated many patients over the years with irregular corneas. Poorly fitting contact lenses have been shown to promote the progression of the disease in some individuals, due to an increase in inflammatory factors released into the tear fluid.15 Poorly fitting contact lenses can also cause permanent vision loss by scarring the cornea.16 Our optometrists use Innovative Contacts, a rigid lens production and distribution company that supplies optometrists all over Australia with an array of contact lens solutions for a multitude of refractive diseases, including keratoconus. Pellucid Marginal Corneal Degeneration is an uncommon condition causing thinning of the lower part of the cornea. This non-inflammatory condition is often confused with keratoconus as it causes similar distortion of the cornea and requires complex contact lens designs, typically in the form of scleral lenses, to give the best quality of vision. Patients between the ages of 20-50 will often present with blurred vision due to the irregularity of their cornea. Often against-the-rule astigmatism is present and contributes to the blur seen. In PMCD, the stroma (collagen) of the cornea is abnormal and thin but the other parts of the cornea are unaffected and function normally. This degeneration can progress slowly over time, but will only very rarely progress to the point of perforating the cornea. PMCD is best managed with large diameter scleral contact lenses that will vault over the affected area of cornea and still provide a regular front surface for vision. In severe cases a corneal graft may be needed to restore functional vision. Collagen cross-linking is a surgical procedure used in some progressive cases to prevent further worsening of the condition. Lawless, M., Coster, D. J., Phillips, A. J., & Loane, M. 1989. Keratoconus: diagnosis and management. Aust N Z J Ophthalmol, 17, 33-60. Gomes, J. A., Rapuano, C. J., Belin, M. W. & Ambrosio, R., Jr. 2015. Global Consensus on Keratoconus Diagnosis. Cornea, 34, e-38-9. Kennedy, R. H., Bourne, W. M. & Dyer, J. A. 1986. Apical changes in scarring in keratoconus. Am J Ophthalmol, 101, 267-73. Godefrooij, D. A., De Wit, G. A., Uiterwaal, C. S., Imhof, S. M. & Wisse, R. P. 2017. Age-specific Incidence and Prevalence of Keratoconus: A Nationwide Registration Study. Am J Ophthalmol, 175, 169-172. Rabinowitz, Y. S. 1998. Keratoconus. Survey of Ophthalmology, 42, 297-319. Li, X., Rabinowitz, Y. S., Rasheed, K. & Yang, H. 2004. Longitudal study of normal eyes in unilateral keratoconus patients. Ophthalmology, 111, 440-6. Karimian, F., Aramesh, S., Rabei, H. M., Javadi, M. A. & Rafati, N. 2008. Topographic evaluation of relatives of patients with keratoconus. Cornea, 27, 874-8. Balasubramanian, S. A., Pye, D. C. & Willcox, M. D. 2013. Effects of eye rubbing on levels of protease, protease activity and cytokines in tears: relevance in keratoconus. Clin Exp Optom, 96, 214-8. Romero-Jimenez, M., Santodomingo-Rubido, J. & Wolffsohn, J. S. 2010. Keratoconus: a review. Contact Lens and Anterior Eye, 33, 157-166. Gokul, A., Patel, D. V., Watters, G. A. & McGhee, C. N. J. 2017. The natural history of corneal topographic progression of keratoconus after age 30 years in non-contact lens wearer. Br J Ophthalmol, 101, 839-844. Goodefrooij, D. A., Gans, R., Imhof, S. M. & Wisse, R. P. 2016. Nationwide reduction in the number of corneal transplantations for keratoconus following the implementation of cross-linking. Acta Ophthalmol, 94, 675-678. Galvis, V., Tello, A., Ortiz, A. I. & Escaf, L. C. 2017. Patient selection for corneal collagen cross-linking: an updated review. Clin Ophthalmol, 11, 657-668. Macsai, M. S., Varley, G. A. & Krachmer, J. H. 1990. Development of keratoconus after contact lens wear. Patient characteristics. Arch Ophthalmol, 108, 534-8. Korb, D. R., Finnemore, V. M. & Herman, J. P. 1982. Apical changes and scarring in keratoconus as related to contact lens fitting techniques. J Am Optom Assoc, 53, 199-205. Ortiz-Toquero, S., Perez, S., Rodriguez, G., De Juan, V., Mayo-Iscar, A. & Martin, R. 2016. The influence of the refractive correction on the vision-related quality of life in keratoconus patients. Qual Life Res, 25, 1043-51. Bergmanson, J. P., Walker, M. K. & Johnson, L. A. 2016. Assessing Scleral Contact Lens in Satisfaction in a Keratoconus Population. Optom Vis Sci, 93, 855-60.